You've seen plenty of articles saying what your macronutrients mean. But what's involved in turning a plate of food into a usable set of data? The 'Skinny Guy Savior' Vince Del Monte breaks it down. Ready to change how you eat? Sure, you could drop that cheeseburger like the hot mess it is and throw yourself into paleo, carb-cycling, or some other system that represents a 180-degree shift from your current eating, but I'm of the opinion that you'd set yourself up to fail. Before you do anything else, you need to learn and practice the skill of "aware" eating. What is aware eating? It's knowing what your food is made of, and using that information to eat better. One of the best ways to do that is to start by tracking the macronutrients—protein, carbohydrates, and fats; as well as total calories—that make up what you already eat. Let me be clear: This doesn't commit you to anything. It doesn't mean your life from here on out will be a never-ending diet, or that you'll have to buy separate food scales for the home, car, and office. All it means is that whatever you choose to do next, you'll do it from a position of knowledge rather than ignorance. That is always a good thing. Just try it for a couple of weeks. What do you have to lose? If I just convinced you to let macronutrients into your life, you probably asked in a sad voice, "OK, how much time will it take and what do I need to buy?" Fortunately, the answer to both questions is "not much." When you are learning to track your nutrition, the three best tools you can have on the kitchen counter are a food scale, a calorie/gram counting book, and a set of measuring cups. I also recommend you keep around a calculator—unless you're a master at math in your head or on your fingers—and a resource of nutritional information. If your food comes with a label, that's a good place to start. However, if you prefer whole foods that come without labels (which, by the way, you should), you have several options. Any calorie-counting guidebook, such as the Complete Book of Food Counts or a similar reference material, is fine. There are also countless online resources; two of the most prominent are NutritionData.com and the USDA's National Nutrient Database for Standard Reference. A growing number of mobile apps also utilize either the USDA or restaurant nutritional info for easy calculations when you're not near a computer. The project of memorizing your staple dishes is more approachable than you think, considering that most of us stick to eating 20-30 favorite foods. Before you know it, you will remember that a six-ounce chicken breast has about 140 calories, a little more than 26 grams of protein, and 3 g of fat. You will also learn to "eyeball" what six ounces of chicken breast looks like without having to put it on the food scale. It took me at least a year until I got confident at eyeballing, and that was after measuring six meals per day. You're not there yet, so keep the scale and measuring cups close at hand. For foods generally weighed by the ounce, such as most meats, use the food scale. For foods where the calorie count is usually measured in cups or other volume-based units, use measuring cups. Determine your quantity, do the calculations, and voila! You know your macros. You now know what your meal is "worth," at least in terms of macronutrients. For example, say you eat about a quarter-cup of almond butter and an apple when you get home from work every day. Nutritional databases can offer incredibly complex breakdowns of micronutrients, up to and including quantities of individual animo acids, but don't worry too much about those unless you have to. As you find your footing, it's OK if you stick to the big ones: calories, fats, carbs, protein. You will quickly discover that macronutrient quantities are rarely whole numbers—no problem. Unless you want to spend more time doing math than eating, don't bother with calculating down to the hundredths of a gram. I just round down if it's .50 or below and round up if it's .51 or higher. Once you calculate your macros—here's the key part—write them down in the notebook. Every successful businessperson knows that what gets measured gets improved. I'll also add, "What gets measured and reported improves exponentially." This basically means that when you measure your meals and report them, your results will improve even faster because of the accountability a notebook represents. However—and this may sound simple, but it's important—remember to jot down which food you eat each meal, not just the macros. That way, after a few weeks you can plan your weekly meals from your notes rather than having to look up every food you eat. Now you know how to measure macros! After you feel confident with it, next determine what your nutritional breakdown will look like going forward, and how the macronutrients in your individual meals will support it. The first number you need to determine when planning your diet is the number of calories your body needs. This number is based on your age, gender, weight, rate of metabolism, activity level, goal, and the amount of time you have to achieve your goal. There are a number of calculators online that can help you get that number, so we're not going to dig too deep into it here. 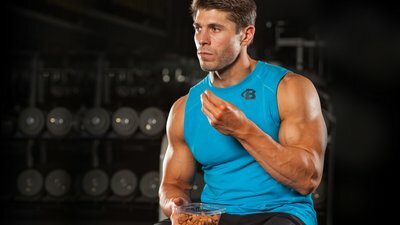 For simplicity's sake, let's say you figured out you need 2,000 calories per day and that you're working out, but not in a bulking or cutting phase. Break your macros down so you know how many calories you should spend on each macronutrient. Let's say you start out on a simple 40/40/20 plan. On a 2,000 calorie diet, that means you need 800 calories worth of protein, 800 calories worth of carbs and 400 calories worth of fat each day. Convert those calories into grams so you know how many grams of each macro you need to get into your daily diet. A gram of protein contains 4 calories. A gram of fat contains 9 calories. 800 calories/4 calories per gram = 200 g of protein. You'll get the same number for 40 percent carbs, 200 g. For the 20 percent fat, the equation is 400 calories/9 calories per gram of fat = 44 g of fat (rounded down). Now you have your number. But you can't eat a number, and you can't predict how it'll make you feel. So while there are classic ratios you can start with, like 40/40/20 or 40/50/10, they should be guidelines, not rules. Try something like 40/40/20, and if you're hungry all the time, increase your protein. If you find your energy lagging, you may want to try increasing your fats. Nutrition for bodybuilding is part science and part art, and we're always trying to strike the right balance between the two. Get as close as you can to your macros, and when you're not at home or are in a rush, eyeball your portions as best you can. Along the way, don't make yourself crazy with the calculations. Get as close as you can to your macros, and when you're not at home or are in a rush, eyeball your portions as best you can. If your protein is a little low one day and your carbs are a little high on another, don't freak out. The last thing you want is for the stress of calculating perfect macros to kill your motivation for eating well. Also, don't get too hung up on minute differences in the ratios. Eating roughly 40/40/20 is better than not knowing what you're eating at all. If you can't track everything, every day, just do your best. It all seems like a lot of work at first, but you'll be able to do this on the fly before you know it.